MV Agusta is a motorcycle manufacturer founded in 1945 near Milan in Cascina Costa, Italy. The company began as an offshoot of the Agusta aviation company which was formed by Count Giovanni Agusta in 1923. The Count died in 1927, leaving the company in the hands of his wife and sons, Domenico, Vincenzo, Mario and Corrado. Count Vincenzo Agusta together with his brother Domenico formed MV Agusta (the MV stood for Meccanica Verghera) at the end of the Second World War as a means to save the jobs of employees of the Agusta firm and also to fill the post-war need for cheap, efficient transportation. They produced their first prototype, ironically called "Vespa 98", in 1945. 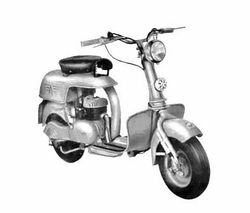 After learning of that that the name had already been registered by Piaggio for its Vespa motorscooter, it was referred to simply by the number “98”. The company successfully manufactured small-displacement, quintessential Café racer style motorcycles (mostly 125-150 cc) through the 1950s and 1960s. In the 60s small motorcycle sales declined, and MV started producing larger displacement cycles in more limited quantities. A 250 cc, and later a smart 350 cc twin were produced, and a 600 cc four-cylinder evolved into a 750 cc which is still extremely valuable today. Following the death of Count Domenico Agusta in 1971 the company declined and by 1980, it stopped producing motorcycles altogether. Cagiva purchased the MV Agusta name trademarks in 1991 and in 1997 it introduced the first new MV Agusta motorcycle. 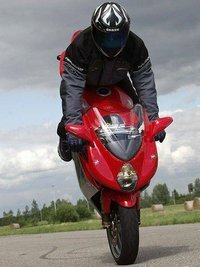 The new bikes were four-cylinder 750 cc sports machines (the F4 range), which included a series of limited production run models, such as the all black paint work SPR model ("Special Production Racing") which was featured in the movie "I Robot" and in 2004, they introduced their first 1000 cc bike. 2004 marked the end of production for the 750 sports machines, with a limited production of 300 SR ("Special Racing") model in the traditional red and silver livery. MV Agusta also made a limited number of F4 750 cc and F4 1000 cc "Ayrton Senna" editions in memory of the late Formula One Champion of the same name (who was an avid Ducati and MV Agusta collector) in aid of the Instituto Ayrton Senna, his charity foundation in Brazil for children and young people. 300 models of each were made in the early 2000's. They also produce a range of 750 and 910 "naked" bikes called the Brutale. Production is somewhat limited, as it is the policy of the company to produce an elite machine similar to Ferrari in motor cars. They do not compete directly with Japanese manufacturers, whose motorcycles typically sell for considerably less than the cost of an MV Agusta. 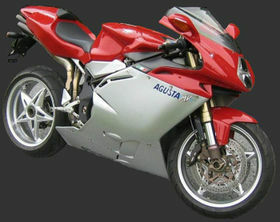 Rather they compete with other Italian models such as Ducati sports bikes the 996, 998, 999, and the naked Monster. In 2005, MV Agusta introduced the Tamburini 1000, which is named after its creator, Massimo Tamburini, who previously worked for Moto Guzzi, and most recently Ducati. Cycle World and Australian Motorcycle News magazine named it the best sportbike in the world. Tamburini designed the Ducati 916 sports bike (predecessor of the 748 and 996 series) which marked the return of Ducati as a successful motorcycle manufacturer over the last decade. The MV Agusta F4 refined the innovative design of the 916. In recent publications, the MV Agusta has been highly praised as one of the best handling motorcycles ever created and the 2008 F4 312R model is known to be the world's fastest production motorcycle. Claimed power of the new F4 312R model is 183HP, although dyno tests suggest it is more in the range of 172-175, in stock performance mode, a condition generally resolved by simple after market adjustments. In 1999 the Cagiva group was restructured for strategic purposes and MV Agusta become the main brand comprising Cagiva and Husqvarna. Heavily indebted, the manufacturer was bought by Malaysian carmaker Proton in December 2004 for 70 million euro. In December 2005 however, Proton decided to cut its ties with MV Agusta and sold it to GEVI SpA, a Genoa-based financing company related to Carige, for a token euro excluding debt. In 2006 that financing company, GEVI SpA, with 65% of the share capital, had refinanced MV Agusta, and by so doing allowed the company to continue, and brought MV Agusta ownership back to Italy. In July 2007 MV Agusta Motor S.p.A, sold the Husqvarna motorcycle brand to BMW Motorrad for an undisclosed amount. Accorting to MV Agusta president Claudio Castiglioni, the sale was a strategic step to concentrate all of the company's resources in order to expand MV Agusta and Cagiva presence in the international markets having more financial resources for new models development. Count Vincenzo and Domenico Agusta had a passion for mechanical workings and for motorcycle racing. They were determined to have the best Grand Prix motorcycle racing team in the world and spared no expense on their passion. They achieved this goal by hiring some of the best riders of the time, namely Carlo Ubbiali, John Surtees, Mike Hailwood, Giacomo Agostini, Phil Read, and others, and having the best engineers, most notably Arturo Magni. The three and four cylinder race bikes were known for their excellent road handling. The fire-engine red racing machines became a hallmark of Grand Prix racing in the 1960s and early 1970s, winning 17 consecutive 500 cc World Championships, and 63 World Championships overall. With the death of Count Domenico Agusta in 1971, the company lost its guiding force. The company won their last Grand Prix in 1976, and by the 1980 Grand Prix motorcycle racing season, they were out of racing. 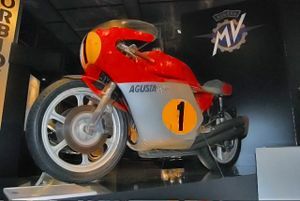 Between 1948 and 1976 MV Agusta motorcycles have won over 3000 races. In 1948 the company built a 125 cc two stroke single and entered Franco Bertoni in the Italian Grand Prix. Bertoni won the event held in Monza and instantly put the new motorcycle manufacturer on the map. In 1949 the 125 cc or Ultra light weight class gained new prestige. More motorcycle manufacturers were competing in the inaugural World Championships that were held in Switzerland, Holland and Italy. The Mondial 125 cc Dohc design dominated the 1949 Grand Prix motorcycle racing season. The MV riders placed 9th and 10th in the final standings. 1950 and 1951 were development years , as the company adopted the 125 Dohc four stroke engine. Racing efforts only produced a fifth place finish at Assen Dutch TT in 1950. The 1951 results were only slightly better. In 1950 Arturo Magni and Piero Remor joined the company after working with Gilera. Magni was the chief mechanic and Remor was chief designer. In 1953 the race engineers adopted the Earl-type forks to help with handling problems on the works racers. The 1953 season saw the introduction of the 350 Four. MV’s racing efforts now included the 500cc, 350cc and 125cc class. With the success of the 52’ season , independent or “privateer” riders could now purchase a “catalog” version of the 125 Dohc , now available through the company. 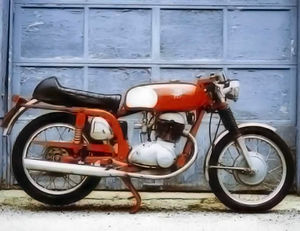 The Sport Compitione racer had many of the same features as the factory bike. These included a multi-plate clutch , gear-driven oil pump , Dell Orto 27mm SS1 carburetor and remote float chamber. The bike was nick-named “The Boy Racer”. 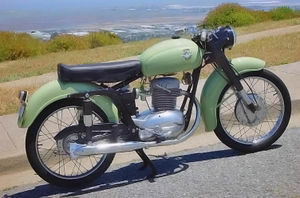 The mid 1950’s saw the introduction of the 175cc class. MV Agusta produced the 175 CSS for street use and also developed a 175cc production racer for privateer racing. The 175cc was very popular in Britain in the mid fifties. Racers like , Micheal O’Rourke, Derek Minter and Bob Keeler raced the 175 and 125 Sport Competizione around Europe with a great deal of success. The marketing strategy of “race it on Sunday , sell it on Monday” was employed . 1957 the young Mike Hailwood raced the MV 175cc . Later , Hailwood would become the one of the most successful motorcycle racers of all time. For racing , early MV racing engines had the right side casting removed for instant access to the gear box. The 1950’s had notable MV Agusta racers like Bill Lamos, Nello Pagani , Ray Amm , Fortunato Libanori , Luigi Taveri , Umberto Mosseti and Remo Venturi that brought many victories to MV Agusta racing. In late 1955 , MV approached and signed John Surtees. 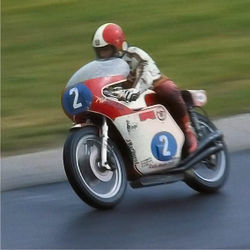 Surtees , in his inaugural season with MV Agusta won the 1956 500c World Championship on the Quattro Cilindri. From 1958-1960 , John Surtees would go on to win an additional six World Championships for MV in the 350cc and 500cc classes . 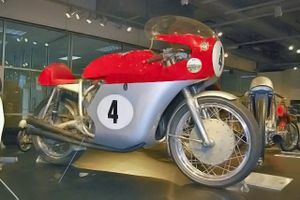 The 1960’s 500cc World Championships were dominated by MV Agusta , with riders Gary Hocking , Mike Hailwood and Giacomo Agostini. In 1968 , Agostini won the 350cc World Championship title , followed by five consecutive years of 350cc World Championships for MV. Although there were no factory racing efforts , independent or ”privateer” teams were racing the F4 750. In 2003 , Big Show Racing , Chicago Illinois; fielded an F4 750 in the Formula USA , Daytona International Speedway 200 Mile Team Challenge. 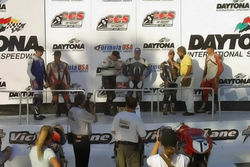 The team placed second overall with riders Larry Denning and Aaron Risinger piloting the bike. In May 2007, the company confirmed its return to racing in the 2008 Superbike World Championship.Carl Fogarty's English based Team Foggy Racing was going to run the team. Fogarty however abandoned the plans to return to the Superbike World Championship because of lack of sponsorship. MV Agusta's racing program for 2008 will see MV Agusta compete in the Italian Superbike Championship and, depending on the level of competitiveness achieved, in select rounds in the Superbike World Championship. Luca Scassa will be the only factory backed rider. His bikes will be developed directly by the MV Agusta racing department in Schiranna, Varese Italy. MV Agusta motorcycles will also compete in the Australian Superbike Championship, the German Superbike Championship, the British Superbike Championship, the French Superbike Championship and the Endurance World Championship. A limited production edition of the F41000R known as the F4 CC, named after Claudio Castiglioni (the managing director of MV Agusta), is the most expensive production motorcycle with a manufacturer's suggested retail price of $120,000 USD.